Phil Delbert (paw paw) started very early in life wanting to serve his country and the community. He spent 2 years in the Army presidential honor guard out of Fort Myers Virginia with the elite Company that provided military funerals, the United States Army Drill team, the Army Fife and Drum Corp and the Tomb of the Unknown Soldier. He served during a very turbulent time for the United States. The Vietnam War was raging and very controversial. During his time in the military Phil married his long time sweetheart, Linda. By the time his service was over, he was ready to jump with both feet into raising a family and going back to school to earn a degree and provide for his family. It was soon thereafter that he started to pursue his goals in life. He was fortunate to achieve all that he set out do. Work in professional Engineering, start a small wood working business on the side, and graduate from the Columbus Police Academy as an Axillary Police Officer. He worked with the Columbus Police from 1973 to 1979. From there he got a job with the Perry Township Police Department and is still active as a Patrol Sergeant. 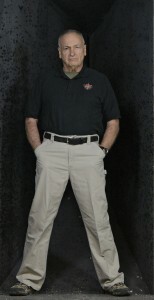 Phil is OPOTA certified to requalify active law enforcement officers in shotgun, semi-auto pistol and revolver. Phil is part owner of L.E.P.D. Firearms and Range and enjoys working with the staff of talented employees to provide a state of the art, safe facility for the shooting enthusiast. His nickname Paw Paw evolved when he became a grandfather. He wanted to substitute some other name besides grandpa because he thought that label made him feel old. He feels old enough and didn’t want a certain name to add to the stereotype. Paw Paw caught on with everyone and now is even called Paw Paw while on police duty. That’s OK…he still strives to keep up with the younger group of employees and police officers and doesn’t let on that it’s becoming harder and harder.